Intel Ireland, celebrated the success of its 2017 “Matching Grant” initiative, donating €560,803 to schools, sports teams and charitable organisations across 22 counties in Ireland. Over €21,000 was donated to organisations in Offaly. 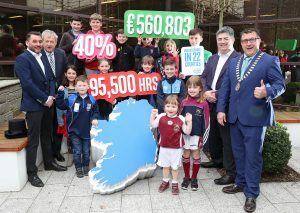 The organisations which were part of the Matching Grant initiative included charities like Jigsaw, Aoibheann’s Pink Tie and Dogs for the Disabled, as well as a variety of sporting clubs ranging from GAA and soccer to cycling, as well as various other organisations such as animal sanctuaries, scouting groups and schools. The Intel Involved “Matching Grant Program” encourages Intel employees to engage in outreach and volunteerism in their communities and supports employees in giving their time and talent to qualified non–profit organisations and schools, by matching every hour of volunteerism with $10 paid from the Intel Foundation to the organisation. In 2017 Intel employees volunteered just over 95,500 hours of their time. This unique initiative empowers employees to make a difference not only with their time, but also to farther support these worthy organisations with a financial contribution.